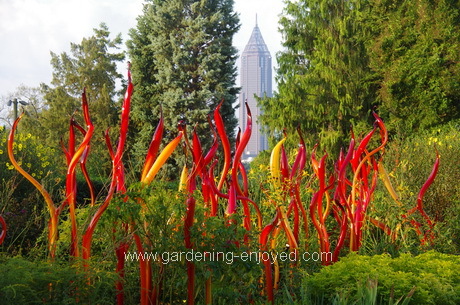 Dallying In The Dirt, Issue #272 - The Atlanta Botanical Garden was a wonderful adventure. Atlanta was a wonderful adventure. Renewing acquaintances with dozens of my garden communicator friends and adding a few new ones to the list. The Assistant Gardener did a fine job of keeping everything alive in the home garden but somehow she didn’t find quite enough time to eliminate all of the weeds. Being a group of people who communicate, through a variety of mediums, about gardening, we naturally get on buses and go out to tour gardens and we saw some delights. The sun shone wonderfully for 2 days and it poured rain on the middle day. I have some wonderful photographs in the Japanese Garden at Gibbs Gardens and they are made all the better by the deluge that descended during our visit. My shoes may be dry by Christmas. One of the highlights was a visit to the Atlanta Botanical Garden. There is a wide range of garden areas to visit and it’s difficult to choose which ones to show you. 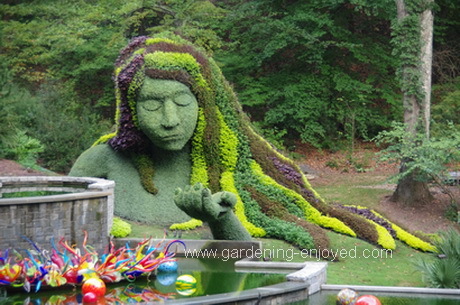 This huge piece of mosaiculture, Earth Goddess, was a memorable feature for me, probably because I understand how much time and effort goes into creating and maintaining it and how difficult it would be to attempt something similar at home. My gardening dreams are always bigger than my ability to create them but that’s what keeps me looking forward. We were fortunate enough to be in the Atlanta Botanical Garden during the Chihuly “Art in the Garden” exhibit. Dale Chihuly is a world renowned artist that works in coloured glass. If you live in southern Ontario there is, currently, an exhibit of his work at the Royal Ontario Museum. There were several pieces of his work throughout the garden, all of which were stunning and all of which, in some way or another, reflected the forms of the plants with which they were sharing space. This huge installation of red and yellow upright, fantastical, forms was spread through a large perennial border and this picture only reveals a small portion of it. None of my photographic attempts to capture the whole thing could, or did, do it justice. It is one of those panoramas that can only be absorbed and enjoyed by the human eye and enjoy it we certainly did. Eventually all good things must come to an end. Atlanta ended and I returned to my own little botanical garden and appreciated its many wonders and then assessed the many chores that will keep me out there communing with nature until the snow drives me to the ski hills. Some are small and some not so small. Often the little chores are very important. 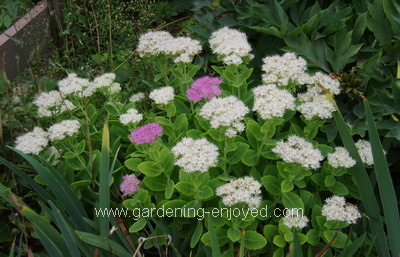 This white Sedum is an unusual plant and it is a chance sport of the standard pink variety. As you can see it wants to revert to that pink type. Cutting out the pink branches, as close to the ground as possible, is necessary in order to maintain the integrity of this white cultivar. A three minute job but one that must be done if I want to continue to have a white Sedum. Despite the continuing warm / hot weather some autumn things happen on schedule. The Colchicum are pushing their large pink/purple blooms up through the soil and the surrounding foliage to provide bright new flowers in the fall agarden. I’m always fascinated by their arrival. It can’t be the temperature, it is still very warm. Can they detect day length even though they are buried under the soil? Such mysteries are what keep me gardening. Donna Asks? , I had a request from a friend for seeds from my echinachea-purple coneflower plant. Normally, I would divide the roots and give her that, but she is wanting seed. So, are they in the cone part of the plant? how to I harvest some, when, and do I dry them now and send or wait until spring? Ken Answers! If your Echinacea produces viable seed they will develop in the centre cone. Never collected them but it should be obvious. Many Echinacea are highly hybridized which means that she is likely to get a range of colours etc from the seed and not a duplicate of yours. I'm hiding from the heat in my office but you made me go outside and look at my Echinacea. When the coloured petals are dried you can easily pry apart the bundle of seeds that now make up the cone. Let the loose seeds air dry for a few days and then send them off to your friend. She probably knows this but they need stratification, that's a fancy term for a cool period to break their dormancy.